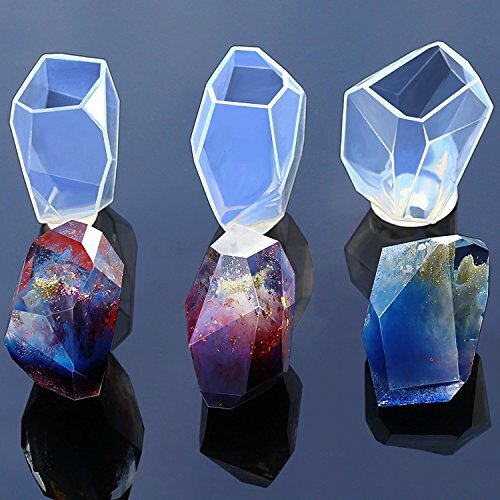 Mtlee 5 shapes resin mould pendant jewellery molds with hanging hole for DIY craft making, semi-transparent Wide range of usage: These molds are good tools to make arts and crafts projects, and you can choose the shape you like to create some pendants and jewellery. 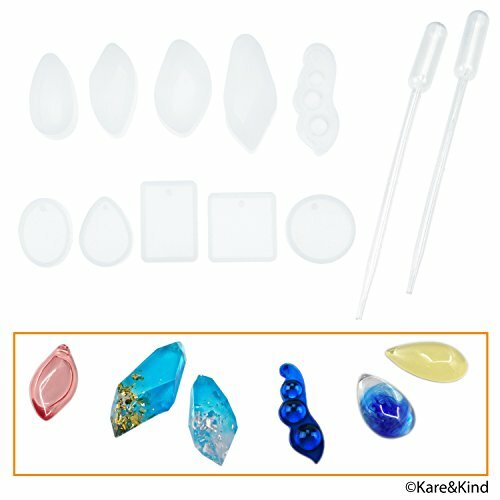 Easy to use: This set of molds is flexible with resin, which help you easily pull your object out from the mold; And each mold has a pole, so that it will leave a hole on pendants. 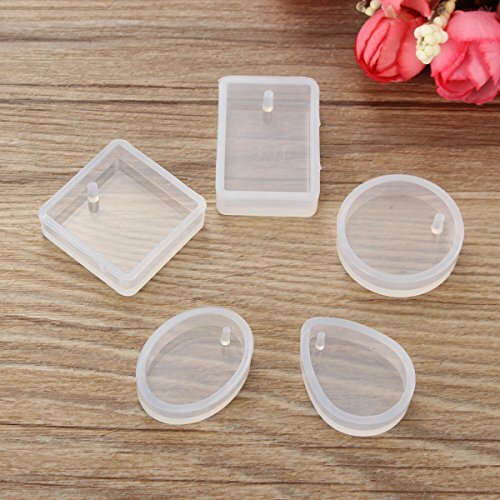 Specification: Round shaped mould diameter: 2.8 cm/ 1.1 inch Square shaped mould side length: 2.8 cm/ 1.1 inch Teardrop shaped mould size (LW): 2.9 x 2.2 cm/ 1.1 x 0.87 inch Oval shaped mould size (LW): 2.9 x 2.2 cm/ 1.1 x 0.87 inch Rectangle shaped mould size (LW): 3.4 x 2.4 cm/ 1.34 x 0.94 inch Mould height: 0.8 cm/ 0.3 inch Material: silicone Color: semi-transparent Quantity: 5 pieces Package includes: 5 x Pendant moulds Note: Put moulds in clean and neat environment and keep them free from dust in case of affecting final effects. Small items, not edible, please keep them away from children under 3 years old. Feature: 1.For each mold's size, please check the 2th image 2.Share your handiwork with your friends and family, enjoy happy times. 3.Material: silicone,Color: white Note: 1.Please stay away from knives and other sharp objects 2.Please prevent children from using it alone Customer Service 1.Our customers are our number one priority 2.Please contact us directly if you have any questions or comments about any of our product listings or brands 3.We appreciate your business! 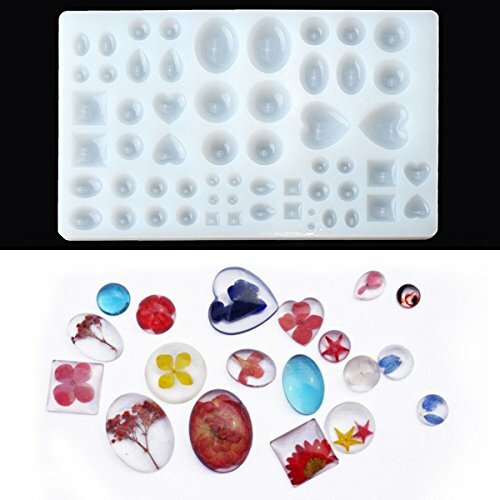 TecUnite 15 pieces resin molds silicone pendant mould for jewellery DIY and 100 pieces eye screw Easy for using: When you release the item out of the mold, just twist the mold, the piece can be easily push out, after using, easy to wash and clean with soap and water, and please put them away from dust after washing. 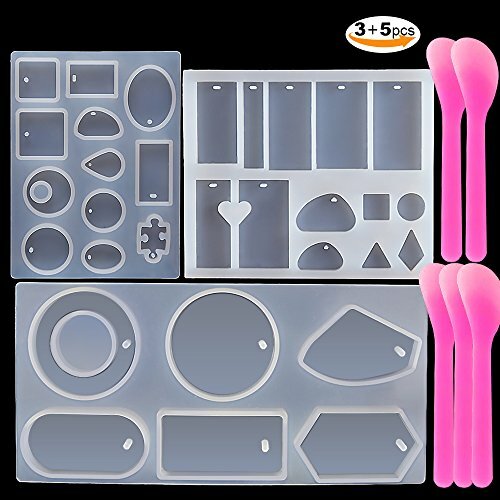 Wide range of usage: These moulds and eye screws are suitable for craft projects making and jewellery DIY, make pendants, earrings or other jewelry items, you can also add some flowers, glitter, colors to make your own crafts. 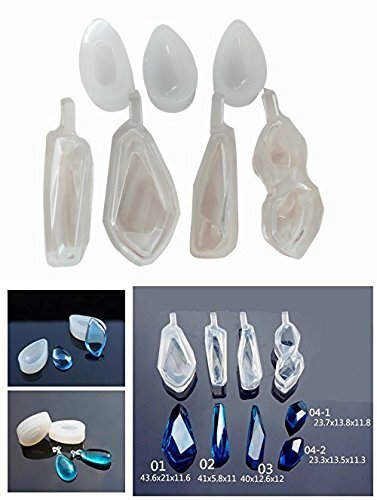 Specifications: Pendant moulds: Shapes: 15 shapes Material: silicone Color: semi-transparent Quantity: 15 pieces Eye screws: Total length: 1 cm Hoop diameter: 4 mm Material: metal alloy Color: silvery Quantity: 100 pieces Package includes: 15 x Pendant moulds 100 x Eye screws Note: Including small items, please keep them away from children under 3 years old. Specification: Material:Silicone Color:Translucent White Size:about 25.5cm(10.03")x1.5cm(0.59")x16cm(6.29") [Conversion:1cm=0.3937 inch,1inch=2.54 cm] Features: -Made of silicone,high flexibility. -Computer Engraving machine production is not deformed. -Easy making and easy out. -Your best choice to make any craft. 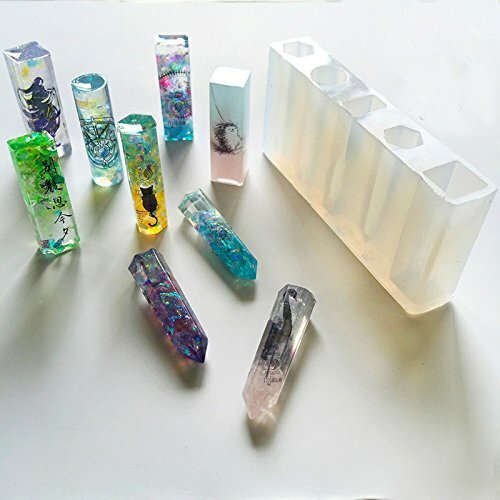 Package Include: 1xSilicone Mold(Not include Jewelry) Notice: -Due to different producing batches, product details might be a little different.If you minding the difference,please buy it carefully. - Please allow 1-3CM differs due to manual measurement. - Due to the different display and different light,the picture may not reflect the actual color of the item.Thanks for your understanding. Package includes: 7 pieces Jewelry Necklace Pendant silicone molds (7 different style mold). 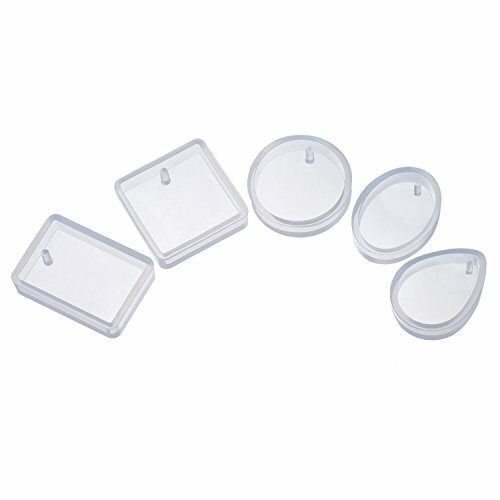 Specification: Material: Silica gel Color: translucent white Size: round: 2.7x0.8cm/1x0.3"(Dia x H) drop: 2.8x2.1x0.8cm/1.1x0.8x0.3"(LxWxH) square: 2.5x2.5x0.8cm/1x1x0.3"(LxWxH) rectangle: 3x2.2x0.8cm/1.2x0.9x0.3"(LxWxH) ellipse: 2.7x2x0.8cm/1x0.8x0.3"(LxWxH) Package Include: 5x Silicone Mold(Not include Jewelry) Notice: 1.Please allow 1-3mm error due to manual measurement. Pls make sure you do not mind before you bid. 2.The color may have different as the difference display, pls understand. 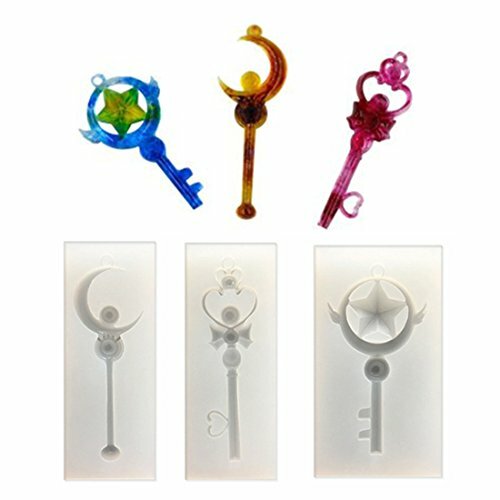 Magic Stick, Moon Sticks, Star Scepter, Pendant Clay Silicone Mold... ★ Quantity: 1 piece . ★ Material: silicone . ★ Descriptions: ★ 1. Tasteless, non-toxic, dust resistant, durable, no permeate and easy to clean . ★ 2. 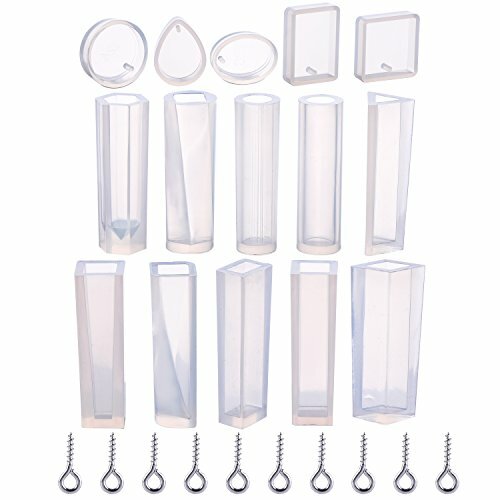 Suitable for making Decorations, pendants,etc . ★ Please Note: ★ Due to hand measure, the size may have 1-2 cm error. ★ Due to Different Monitor, the color may have difference. Copyright © Wholesalion.com 2019 - The Best Prices On Pendant Mold Online.